Working poverty is a persistent problem, despite a continuing recovery in the UK economy following the Brexit vote, a new study claims. The Joseph Rowntree Foundation (JRF) blames high rental housing costs for an estimated 3.8 million workers, one eighth of the population being “in poverty”, what the May government has termed the JAMS – the “just about managing” families. JRF claims that in-work poverty has increased by 1.1 million people since 2010-11, and says that 55% of the people in poverty were in working families. People with less than 60% of median income, currently around £22,000, are classified as poor. However, the government says overall poverty is down: its figures suggest poverty numbers have actually been falling compared to six years ago. “Since 2010, the number of people living in poverty has fallen by 300,000 but we know there is more to do. We are increasing the National Living Wage and taking millions of people out of income tax, to make sure it always pays to be in work,” a government spokesman told the BBC. In terms of global poverty criteria, the United Kingdom is a wealthy country, with virtually no people living on less than £10 a day. A recent Bank of England study says around 800m people world-wide now live on less than $1.9 per day, a figure which is down from 1.9bn in 1981. In 2012-13, UK median income was approximately £21,000 a year but this varies considerably by age, location, data source and occupation. However, there is both significant income redistribution and income inequality in the UK; for instance, according to a one source, in 2013/14 income in the top and bottom fifth of households was £80,800 and £5,500, respectively, before taxes and benefits, a ratio of 15:1, but after tax and benefits this ratio changes significantly, with these household income disparities reduced to £60,000 and £15,500 respectively, a ratio of 4:1. Stating that the economy is “is not working for low-income families” the new JRF report says 7.4 million people, including 2.6 million children, are living in poverty despite being in working households. They think there is “growing insecurity underneath the positive economic picture,” which includes rising levels of employment. “The economy has been growing since 2010 but during this time high rents, low wages and cuts to working-age benefits mean that many families, including working households, have actually seen their risk of poverty grow. “As it negotiates Brexit, it is vital that the government does not allow its focus to slip from the domestic concerns that make a huge difference to people who are just about managing. This report shows that people on low incomes cannot rely on economic growth and rising employment alone to improve their financial prospects. The JFR study suggests that although pensioners are faring better, the biggest losers between now and 2020 will be lower income families, with the poorest third of these likely to see incomes drop. JFR are blame housing costs, “especially in the private rented sector”, where they claim the numbers living in poverty has doubled to 4.5 million in a decade. This, they say, is the main reason for London recording the highest poverty rate which is 6% above the UK average at 27%. Savills the property agents and consultants have forecast that rents across the UK will rise considerably faster than house prices over the next five years. 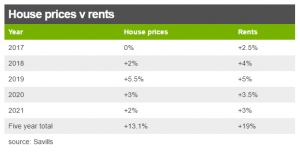 It predicts that rents will go up by 19% between now and 2021, while house prices will rise by 13% – see chart. Another study by the Institute for Fiscal Studies (IFS), produced at the time of the Autumn Statement, but since heavily criticised for being too negative, suggested workers would feel the squeeze on pay for more than a decade – earning less in real terms in 2021 than they did in 2008. Next articleAre UK landlord’s days numbered?